On 4th July saw David, Terry and I were at Borders, Oxford Street, London. I arrived to a fabulous welcome from the events manager Mark and I found I had a table on the first floor right in front of the escalators. It was a very good spot. Borders is a massive store; there were thousands of people milling around that day. We stayed a few hours and sold some books and then later on left a stock of signed copies to be put out on the shelves. A few days later Mark told me that the stock had almost sold out! So that was a brilliant result. 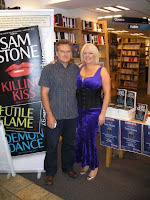 Last weekend we were in Waterstones in Bury, Lancashire and this was a really surprising venue. The bookstore is situated in the Union Arcade Mall, in the centre of the relatively small town of Bury. Bury itself has all of the high street shops but it is nevertheless on a very small scale. Bury is a local venue for me because I lived in the area for most of my life. I did expect some people to turn up to the signing that I knew but nothing could prepare me for the waiting queue when I arrived. Several people said they had heard about the book. One was a teacher from a local high school, who told me that he'd heard his students talking about me and the books and had incidently come across the advertising to say I'd be there. Others told me that friends and relatives had read the first one and had recommended it. It was terrific to talk to so many charming and interesting people. We were time tabled in at Waterstones for only an hour but ended up staying a little longer because of the interest.The sales exceeded our expectations. And Waterstones was pleased too. Just before we left the Assistant Manager told me that she thought it was a very successful signing and that it 'had been better than most'. 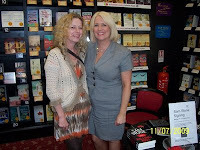 She also invited me to come back when we launch Book 3 - which I most certainly will, because the staff made us feel extremely welcome. I've always know Bury to be full of lovely people and it was nice to go home and feel so warmly received again. Here's a selection of other pictures from the event. 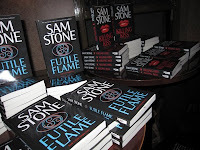 As you know we launched Futile Flame Book 2 of The Vampire Gene Series on Friday 3rd of July. The event was extremely well attended. 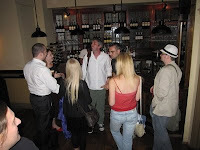 At the start of the evening David and I arrived early at The George, Fleet Street, London and were given access to the venue's private room immediately. Terry Martin the MD of The House of Murky Depths had yet to arrive and I was all jittery and nervous, because I hadn't even seen a hard copy of the book yet. Writing a novel in many ways is like giving birth; there is a lot of pain and agony involved in the process but for all the months of stress, you produce a baby that you love. Like all mothers I wanted to see my offspring for the first time, and also I hoped fervently that it was liked and even loved by others as well. 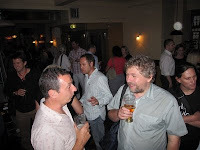 So, I was pleased when a rather stressed Terry arrived (he'd been stuck in peak-time traffic in London centre) and boy did he need a long drink! The books were brought up and displayed and immediately I scrutinised a copy, gulping down a large glass of white wine in a state of nervous agitation. Lots of worries were in my mind. Will anyone attend? Will we sell any copies? Will the critics like the second book, or will they think I've peaked too early on the first? It's quite a dilemma. Suddenly people began to pour in. Some I knew and had hoped would attend, but lots of faces I didn't know. Several people came over, examined the book and stopped by to talk to me. 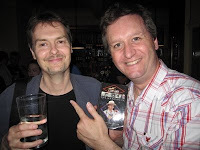 The event was hosted by the British Fantasy Society (BFS) and was being held with a Torchwood Writers' panel. 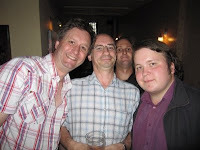 So I ask a few of the new faces, have you come for the Torchwood Event and they said 'No, we came to see you!' I was completely bowled over. More people arrived. 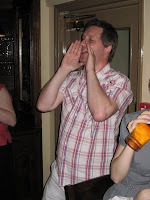 David made an announcement and explained a little about the books and the event followed by Martin Roberts from the BFS, then it was over to me to say a few words about the books. Finally Terry expressed his pleasure in the new book and then there was a rush of sales. Luckily I'd brought a great red pen with me and I wrote personalised messages for everyone who asked. The evening progressed with the arrival of some of my friends from the Doctor Who circuit, who I regularly see at the London Tavisode or spent time with at Gallifrey in LA in February. 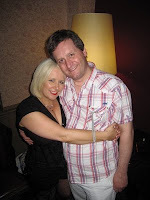 As well as David and I's lovely friend Ellie who brought along some other friends. 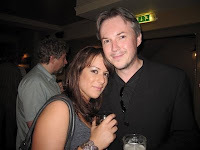 Celebrity appearances involved writers such as Robert Shearman, Simon Messingham, Suzanne Barbieri, Adam Nevil (and watch out for him because he's just signed an amazing book deal with Pan Macmillan). 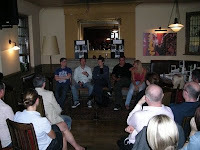 Within the Torchwood celebs were Andrew Cartmel, Mark Morris, Joe Lidster, Sarah Pinborough and Guy Adams. Here's a selection of other pictures from the night. 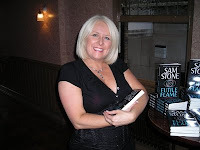 Overall, I think my editor, Terry Martin, was extremely pleased with the launch sales and so the launch of Futile Flame had a very positive start.